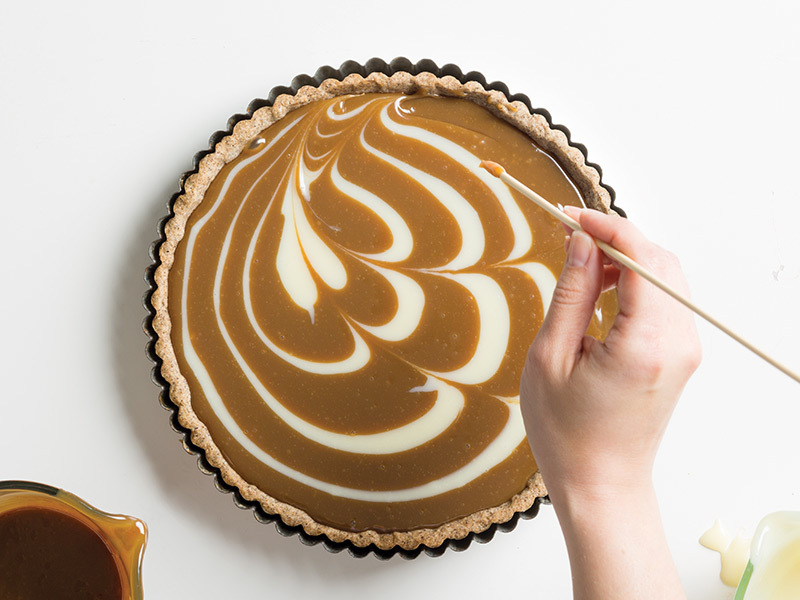 Channel your inner barista and learn to create the latte art-inspired ganache swirls of our Macchiato Chocolate Tart. Two ganache toppings are pooled and swirled into a mesmerizing design. Here’s how to do it! 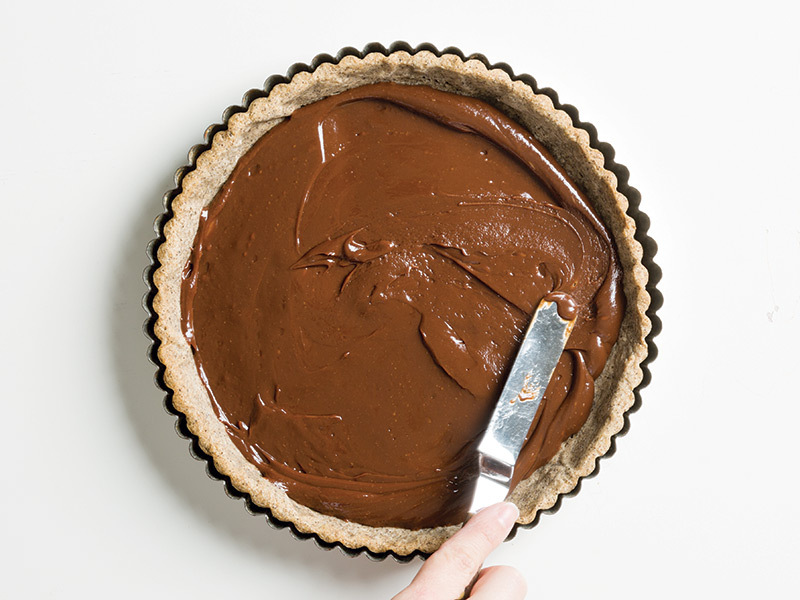 Step 1: Using an offset spatula, spread your Milk Chocolate Ganache into an even layer into your baked, cooled tart crust. Refrigerate for 45 minutes to create a chilled, smooth base that won’t bleed into your latte art. 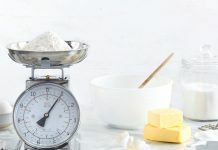 Step 2: Make sure that both your Caramelized White Chocolate Ganache and White Chocolate Ganache are warm and on hand so that you can move quickly between the next steps. 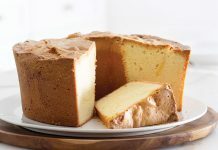 Pour about 1 cup Caramelized White Chocolate Ganache over the milk chocolate layer, and spread with an offset spatula. 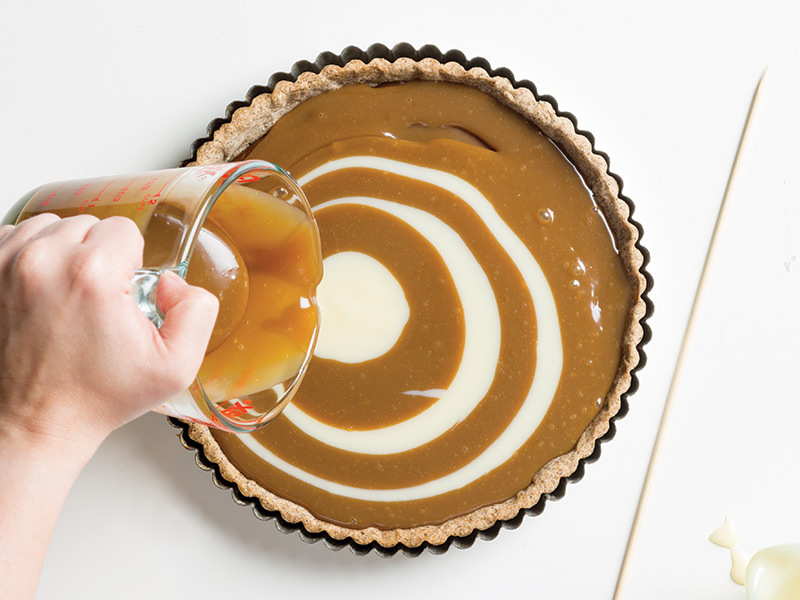 Step 3: In the bottom third of the tart, pour a pool of Caramelized White Chocolate Ganache. 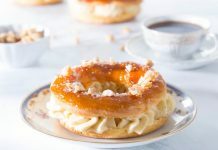 Immediately pour a dose of White Chocolate Ganache into the center of the recently poured ganache circle, making a ringed, circular pattern. Repeat this alternating ganache process three more times. Step 4: With each pour, you’ll use slightly less ganache so that the ganache spreads into smaller and smaller concentric circles. 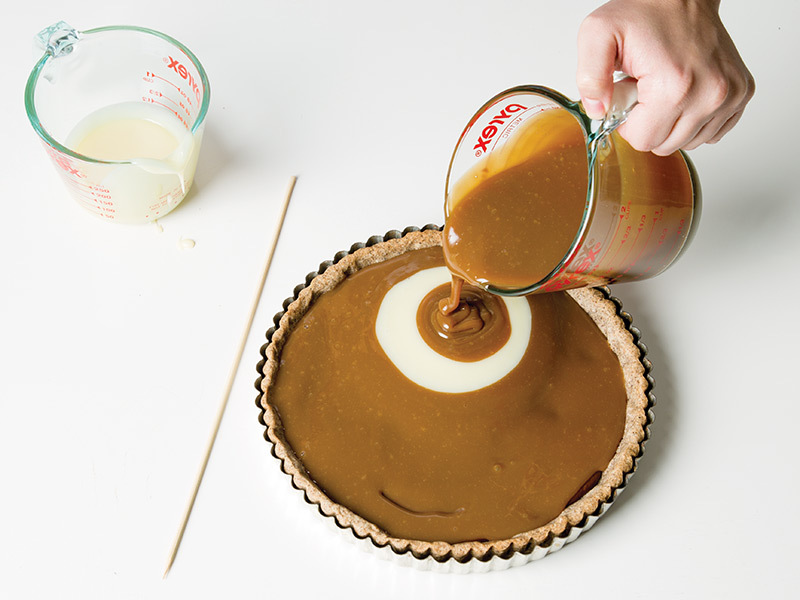 Don’t worry if the circle spacing isn’t perfection—the ganache is very forgiving. The end result will be seven to eight rings surrounding one white middle, looking like a slightly off-center bull’s-eye. Step 5: With a fast steady hand, drag a long wooden skewer through the center of your ganache rings in an arc. For reference, the first arc should neatly bisect the center white chocolate circle to create a heart-like shape. Remember to make shallow drag marks—you don’t want to dig into the milk chocolate base layer. Draw four more arcs, starting at a different point on the tart crust edge, but looping back to the same terminus, below the central white chocolate pool. Step 6: Once you’ve finished drawing your arcs, carefully transport your tart to the refrigerator to set. Keep your hands steady when transferring. 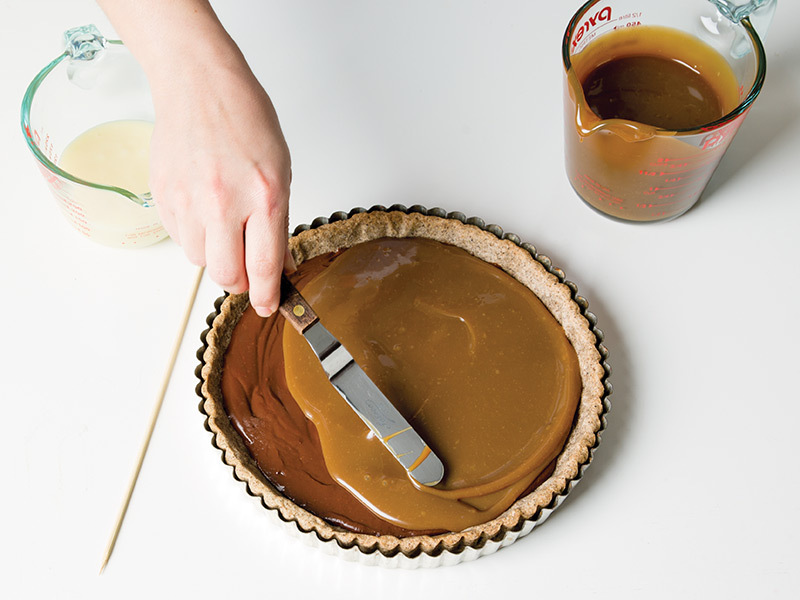 If you tilt your tart, the still-warm ganache will lose its defined shape. 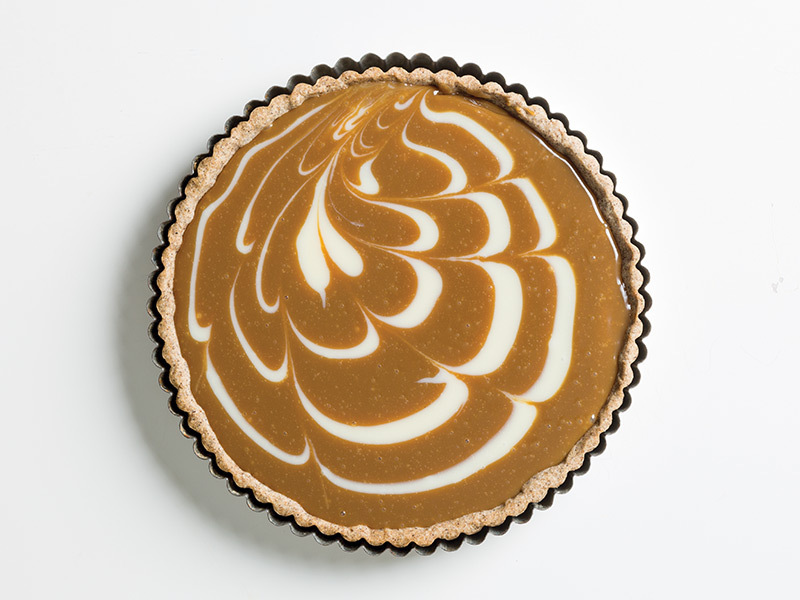 In 1 hour, you’ll have a perfectly set showstopping tart with latte art design. The beauty of imperfection: Every time you make this design, it’ll look slightly different. Embrace the deviations! As long as you keep to the formula, it’ll always take on the appearance of elegant foam art on the top of a latte.